...that I am going to need some recipes for! 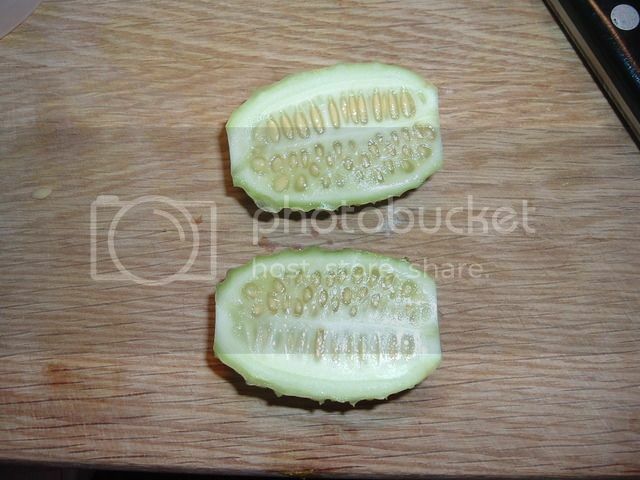 Bitter Melon (Shanghai variety...I was amazed at how many varieties there are!) 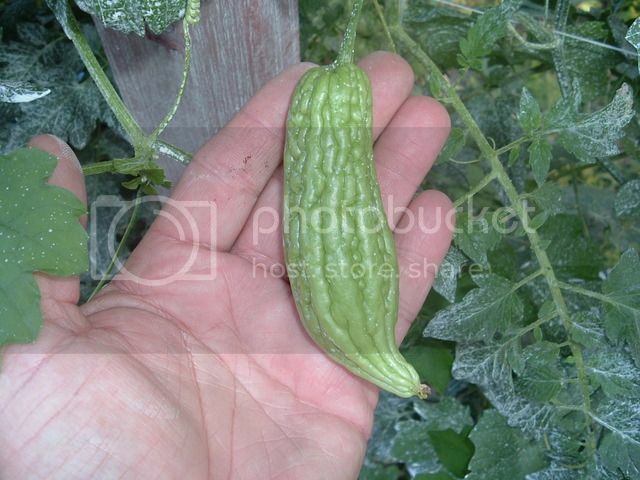 and Indian Gherkin. The gherkins are still a bit small, but probably doubled since I looked at them last! Any favorite recipes out there? 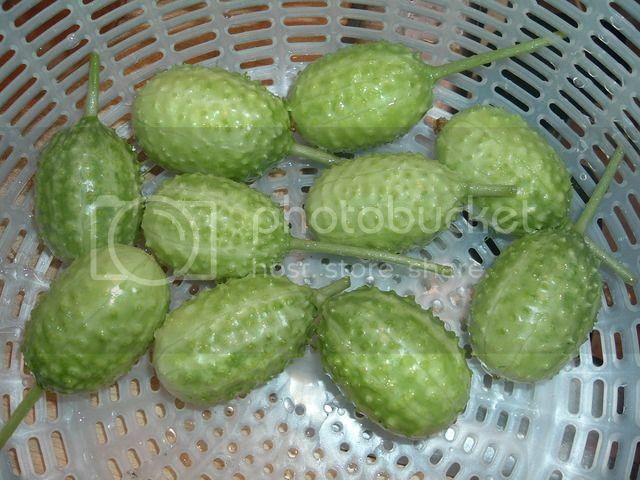 Can't say I've heard of Indian gherkin before. Here's a better photo of the gherkins. I counted 23 over 1" long today, and I lost count of the smaller ones! I'll harvest some today - I think that some have reached the max. size. Here are some more photos of the gherkins. I harvested all of what looked like max. size (they seemed to have stopped growing), though there were countless more out there just under this size. The flavor is strong, but not bitter, both raw, and after pickling, and incredibly crunchy! I did a fast, Chinese style pickle - 1/4 c each white vinegar and sugar, plus about 1/2 tsp. salt. Only takes about 3-4 hrs. in the fridge, tossing several times, and keeps for a long time. The only drawback to these is the deburring - something I tried several approaches to - scraping with a paring knife, making a burr on the knife by honing it a bunch of times on just one side (worked better, but still time consuming), a veg. peeler (not very good), rubbing with an abrasive pad (better, still not good, though I didn't have any scotchbrite, which may be better), and, the best, so far, a SS scouring pad - something I very rarely use! I have some extra coarse scotchbrite pads in my workshop, so I'll try those next. 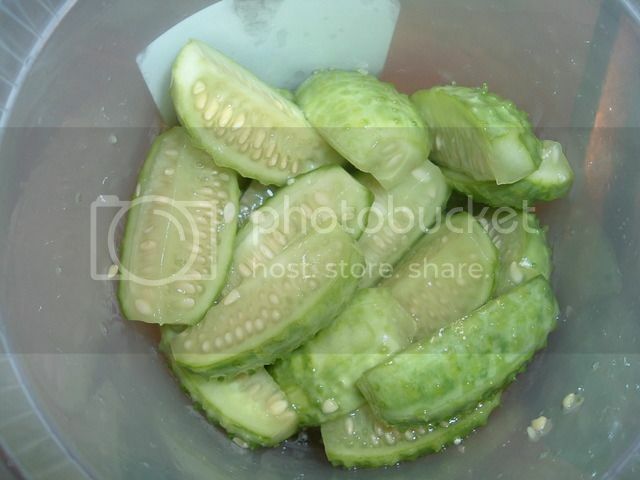 They look a lot like lemon cucumbers on the inside.